If there is one place in your house that you would want to spend your summer in, it would probably be your deck. Installing a deck is a good way of expanding your living space. Instead of letting that space in your yard vacant, a deck would be a wonderful addition that you and your family will enjoy. Because of the many benefits that you can get from a deck, it is necessary that you keep it clean and well-maintained regularly. One of the best ways to keep your deck in good condition is by getting a deck staining Overland Park, KS service. Making sure that your home’s deck in Overland Park, KS is stained regularly is important for a number of reasons. You may not be aware of it, but if your deck is made of wood, it can easily deteriorate. It is susceptible to rotting and molds, and mildews may develop on its surface in no time. You may also clean it yourself but there are things that only a professional service can remedy. Our company has been offering professional deck staining in Overland Park, KS for many years now. If you do not see the need for a professional staining, below are the major reasons why you should get one. Prevents Deterioration – Your deck is always exposed to harmful elements and extreme weather condition. These negative effects which can damage the wood of your deck can be reversed by a professional deck staining in Overland Park, KS service. Is Affordable- Overland Park, KS deck staining is a cost-effective way of maintaining your deck. It will protect your deck from being damaged easily, saving you money from costly repairs. 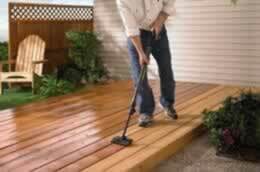 Extends Life – Deck staining in Overland Park, KS can help in extending the life of your deck. Because it shields your deck surface, it will not deteriorate nor will harmful substances damage it easily. This can add years to your deck’s life.